It is hard to imagine another place in the world that has suffered as much since the 1970s as our neighbor to the North, Cambodia. Barely a decade has passed since the series of invasions and the horrific civil war have ended. As we are flying into Siem Reap (literally Siam Defeated) my expectation is once again altered as in every other new country that I have ever entered. The airport visa system is extremely well organized and efficient, the airport new and attractive, and the money exchange process quite easy. We arrive on Christmas Eve, take our first adventure with a Muslim driver, in a country that is 90% Buddhist, and whose greatest attractions are largely Hindu. The gentleness, warmth, and togetherness of the people make it difficult to imagine the millions who were slaughtered by their own hands. Peace is a great blessing to a country and being in Cambodia on Christmas in a peaceful place is a great blessing for us. Santa couldn’t find reindeer in Cambodia so he came in an ox-cart. Tonle Sap Lake is the home to floating villages. It is poor for sure, as we enter we pass house after house 3- 5 meters off the ground to protect from the rising waters in the rainy season. We are in the dry season but there is still enough water for the floating structures. Debby and I are the only passengers on boat designed for about 12. The young children are in school making the universal noises that they make everywhere in the world. What is different about these children is that there school house is floating in the water, buildings on barges. Even the basketball court is a floating structure. The houseboats are simple structures, the life even simpler, but Debby and I notice almost simultaneously, the bougainvillea and other flowers on the smallest of places. Beauty and its attraction does not belong to the rich. It is found in all classes. It is a lesson that will test me again. I am writing this journal on leaving Siem Reap on our way to Battambang in a bus occupied by 80% Cambodian and a few gringos like us. The bus has just stopped by side of the rode adjacent to a rice field. The bus driver yells something out in Khmer and many get off the bus. They go out into the field men and woman alike and have a pee break. Debby follows. They all return to the bus and now we are on the bumpy road again. Life is still simple and uncomplicated. Wealth will no doubt come to Cambodia quickly as it has to the rest of Asia. It is easy to see. One day soon the buses will all have toilets and this part of life will disappear. I wonder if Isa and Olee and Diego, our grandchildren, will have this chance to pee by the side of the road. So I put this in my memory that simplicity has its place. 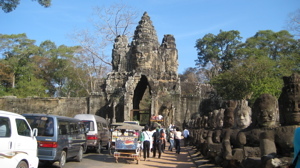 We have two days to visit and study the vast temple complexes of around Siem Reap, the center of an empire that once covered most of Thailand and Vietnam. So as I am thinking about how to learn about the great empire, I am imagining myself walking through the ancient structures with a guide at my side who will answer every question of my inquisitive mind. And this is the plan. We have some contacts in Siem Reap through the Baha’i Community there and even a couple who we decide to hook up with on this journey to the past. 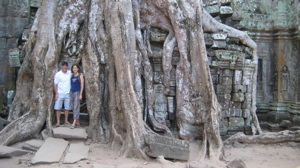 But as fate would have it somewhere between leaving Siem Reap, getting our 3 day pass, and arriving at the first temple site, we lose the guide and the other couple. My inner process has a huge flare up because my expectations of how to proceed through the ruins quickly vanishes before my eyes. Debby asks me how long I am going to have my attitude. I tell her that I will deal with it somehow. Somewhere in the midst of my disappointment I pull a “Juliet”. (Juliet is our youngest daughter and pulling a Juliet to me means being aware that something out of the ordinary needs to happen). I say to myself that if I really needed a guide on that day, the guide would be there. As we leave the first temple and proceed to the next, my inner guide begins to awaken, but I still have a bit of the old expectations. The next stop is an ancient reservoir. My attitude says what do I want to see a reservoir for, but inwardly I begin to see the things that a guide could not show me. The place where water is stored is surrounded by beautiful sculptures and intricate carvings, and then I begin to see the real Angkor for the first time. Why would a culture, nearly 1000 years old build a place to store water as if it were a holy temple? It seems to me now that the organizing principle of the culture is beauty, an attempt to transform the ordinary into the sacred. The symbols around the reservoir make it clear to me that it is a place of healing, that the waters are sacred, and that the lure is beauty. 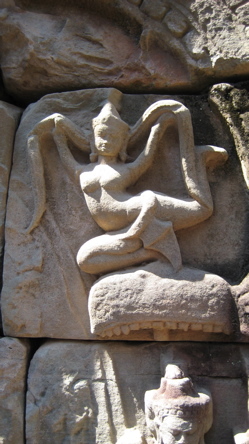 As we enter the next temple my attention is drawn to Apsara, the feminine divinity that is shared strongly in these ruins in both Hindu and Buddhist structures. Everywhere you go Apsara is with you. 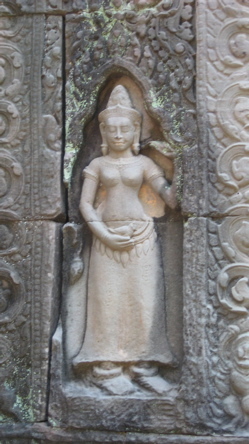 The masculine images pale in Angkor in comparison to the quantity of feminine ones, which reinforces the value placed on beauty and other feminine qualities. We end our first day with a visit to the temple where Lara Croft Tomb Raider was filmed. 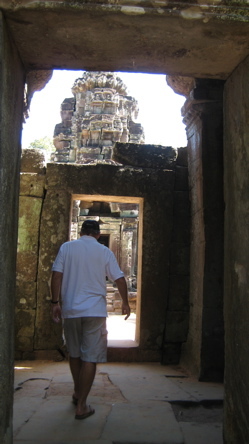 When the French colonized Cambodia in the 19th Century and then began to do archeological work. 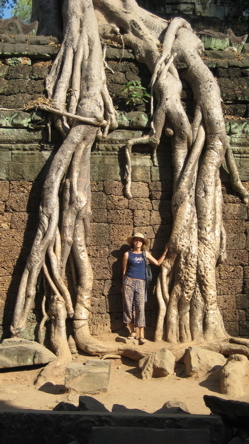 Much of the temple structure had been overrun by the jungle. That night, after having discovered some of the mysteries of the ancient past, we head to downtown Siem Reap, and eat burritos at a Mexican restaurant with some friends from KL. It reminds us that world has grown small. After having gone through my crisis with the guides on the first day, I have decided that on day 2 that I will not force the hand of the inner world. We plan for a guide again on this day, he shows up, and remains with us the entire day. Life is mysterious. 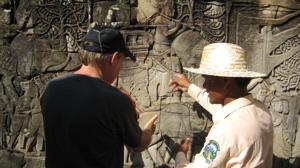 Visiting the sites of Angkor Thom and Angkor Wat with a guide to explain the history and significance was how I had imagined the first day. 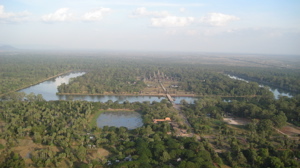 Although Angkor Wat is the most famous temple structure, our favorite by far is Angkor Thom, built by what seems to have been a very benevolent ruler. 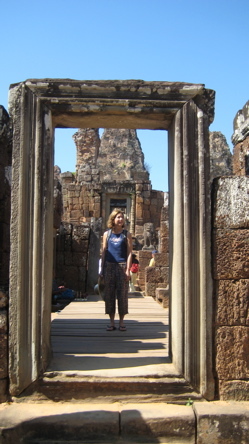 It is a Buddhist structure, whereas Angkor Wat is Hindu. The smiling Buddha seems to reflect our feeling here. To end the day we take a small hot air balloon ride, which gives us a panoramic view of the things we have taken in at ground level. Our purpose in visiting Battambang, the second largest city in Cambodia, is to meet some of the Baha’is in the area and do a couple of presentations. Our first experience happens on the back of motorcycle. 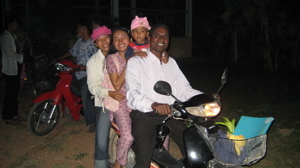 It is not unusual to see a family of 5 riding on a motorcycle. What we would have been so judgmental about only a couple of days previously we are now doing. There are three interesting projects in this area, CORDE, UniEd, and Gems International School. CORDE is a development project that teaches people in the villages English classes combined with materials that are oriented toward positive values such as service to the community. Families donate part of their land to build a classroom structure and then funds are raised for the building. Except for the directors of each building all of the teachers are volunteers who have gone through the coursework previously. Even some of the Buddhist monks from the area are volunteers. They are all quite enthusiastic about doing the work. UniEd is a small university of about 70 students. One of the problems of Cambodia in its transitional period is that students have to pay a fee that is quite exorbitant in order to pass the high school exam. UniEd created a more open entrance policy that doesn’t require students passing the high school exam. It also teaches all of the classes in English, which allows Cambodians the students to take advantage of resource people and instructors from outside of the country who don’t speak Khmer. Gems Intl. School is a kindergarten, which is also English based. The topic about which I am speaking at UniEd is moral leadership, which means leadership that is more group oriented and based upon positive values and the development of capabilities. The night before the presentation I have a dream in which I am truck driver. In the midst of the dream a King Kong like character is brought into the truck, breaks free and then tries to cause lots of havoc. It takes me about an hour to go back to sleep after the dream because I realize that it is the history of leadership in Cambodia. 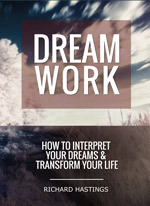 During my presentation I use the metaphor of the dream for nearly the whole first hour. 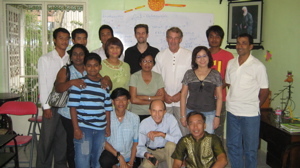 Later when we are in Phnom Penh, we hook up with one of the Baha’is who attended the talk. He is there to meet with other NGOs about some projects he is doing so we decide to have breakfast before he has to go off to his meetings. He tells us that he has to talk with us about his King Kong issues, which let me know that the metaphor presented in the dream really works. In the afternoon after my presentation at UniEd, Debby gives a presentation to parents at the Gems School about the Virtues Project. What she teaches is quite revolutionary for parents everywhere, but particularly in Asia, that when you name positive virtues in children and call them to those virtues, rather than belittling them with constant nagging and criticism, that they become those virtues. She gets them to begin making a commitment to that promise and promises them that she will return. 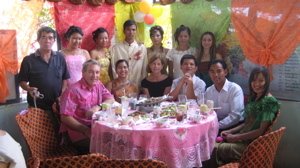 Our time in Battambang is mainly about making Cambodian friends. We have planned to leave the area on the 30th, but the Baha’i friends encourage us to stay for a wedding of a young couple. These pictures tell that story. I wish that I could share more of Battambang, but my pen would die of exhaustion and so would you. When I was a young man in high school, I attended some Christian gatherings, one put on by an organization called Young Life or something like that. I loved the activities they did until it came to the part where they said that Jesus was the only way to God, that if you didn’t believe that He was the only way, that you would go to Hell. I remember quite clearly thinking that there were a large number of Buddhists in the world and that I couldn’t see how God could condemn them all to damnation. 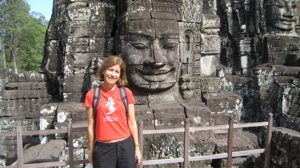 Cambodia is a country that is 90% Buddhist. The people are gentle, hard working, and family oriented. Being with them in friendship is a heavenly experience. The air-conditioned bus to Phnom Penh is freezing. Debby has to put her feet in her day pack to keep them warm. 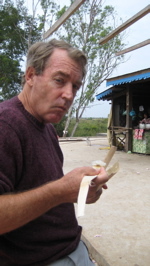 We pee again by the side of the road and later stop for coconut rice served inside a bamboo stick. The prices in Cambodia for things are really quite unbelievable. For $2-3 you eat really well. The Khmer food is not so spicy like Indian or Thai food so if your palate or gut cannot take it, Cambodia is a great place for you. We arrive around 2 pm in the afternoon, make our way in a tuk-tuk to the Burly Guesthouse, where for 13USD per day you can get air-conditioning and cable TV. I even see part of the Rose Bowl one night, but since it doesn’t begin until 10:30 PM local time, I fade after the first quarter almost like Illinois. We had met a couple, Sherif and Shaku Rushdy in Battambang, who had been living in Croatia and now Kyrgyzstan doing lots of development work throughout the world. They also know Shane quite well, so we spend New Year’s Eve with them. Phnom Penh is really vibrant for us. We walked along the riverfront, eat more burritos, enjoy the festive atmosphere. Jan. 1st is a national holiday so it seems as though everyone in the city is out to enjoy the New Year’s party. Fireworks begin at midnight but we are already in bed for an hour by the time the noise begins. There are 2 big markets in Phnom Penh, the Central and the Russian where you can buy name brand clothes from the local factories that make them like Polo, Tommy Hilfiger, Adidas, Boss, Camel, and others for unbelievably low prices. A dry fit Tommy Hilfiger shirt is $5. Needless to say a certain member of our family is extremely excited during the times we are in the markets. The afternoon after we visit the Central Market I give a workshop again on the topic of personal transformation at the Baha’i Center. 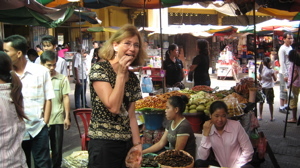 The woman in charge of the Center, Yvette, is a Cambodian who had to flee to Vietnam during the Pol Pot regime. Her uncle was a general in the Cambodian army before the Khmer Rouge so when the takeover happened in 1975 the new government invited all of the old leaders to join the new army and promised them positions. Instead they were all shot. Debby and I didn’t visit war sites in Vietnam where we were last year because Vietnam is sewn into the fabric of our souls from when we were young. 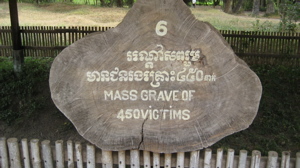 There are no words yet created to describe the horror of the Pol Pot Regime. Day 3 in Phnom Penh is our pilgrimage to one of the worst nightmares of the 20th century. 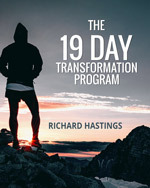 It is difficult to experience, sobering, draining, and difficult to return to joy afterward. The Toul Sleung Museum is our first stop, which is school that was converted by Khmer Rouge into a prison where they brutally interrogated people to extract information and then later killed them. Our guide takes us through each room and explains the methods. There are hundreds of photos from small children to older persons who were all tortured and killed. The regime made a habit of photographing the victims so that everyone would believe that they were doing the killing. Such was their perversity. Pol Pot was so extreme and paranoid that even killed many of his own soldiers. At the end of the tour I ask our guide about what her experience was. She explains how she was only 14 that her father was a member of Parliament, her mother a French teacher. She is forced to walk from Phnom Penh to nearly the border in Vietnam, a journey of nearly two months. Her mother and father are murdered as are her grandparents. Only many years later does she find that her brother is in San Diego. In the commune where she is forced to do slave labour she is sick all the time, an illness that continues until today. The nightmares also continue so she takes medication each night to sleep. Debby and I are holding back our tears, but we are moved beyond that which we can explain. She calls her daughter and niece over to us who are both vibrant and enthusiastic young people. We share a few moments together and try to find a way for her to meet some of our new friends in the city. During the meeting on personal transformation the day before I talk for several minutes about Debby’s story and some of her difficulties as a young woman. After the meeting I tell Debby that I was feeling the presence of her father, which I feel again in the prison. After the prison we hire a tuk-tuk to take us out to one of the hundreds of Killing Fields in Cambodia. This one is located 15 km from the prison in a place that is strangely peaceful and serene with a beautiful lagoon, but what happened there is quite the opposite. Pol Pot only died in 1989 from natural causes because the only way to get peace in country after the Vietnamese left was to give amnesty to the Khmer Rouge. Many of the regime are in prominent positions and it is only within the last few weeks that some of the major players have been arrested and face trial for crimes against humanity. After the very sobering morning we wonder how we are going to get back to some measure of joyfulness and yet not forget what we have seen. I think about the all of the young boys who were forced to be soldiers and kill incessantly and what it will take for them to be rehabilitated. It is a staggering thought. We eat lunch at a restaurant called Friends, which is a project to take young people off the street and give them meaningful work. 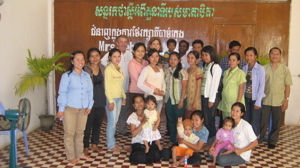 Cambodia has become the land of NGOs, some positive and some not-so. The lunch is a good transition from the morning taking us from the worst degradation to the hope. Afterwards we visit the huge royal palace and National Museum. In the evening we visit the Baha’i Center again and sing songs and play some cooperative games making more friends with our favorite age group, teenagers. During our flight and taxi ride home we talk about how amazing the trip has been, how different than our other holidays, and how grateful we are. We are wondering and hoping for an early return. This sounds like a really life changing kind of trip. The beauty of the temples is outstanding and the suffering of the people are heartbreaking. 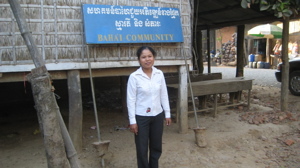 I would love visit the houses on stilts and villages with the Baha’i schools.